This poses a problem. 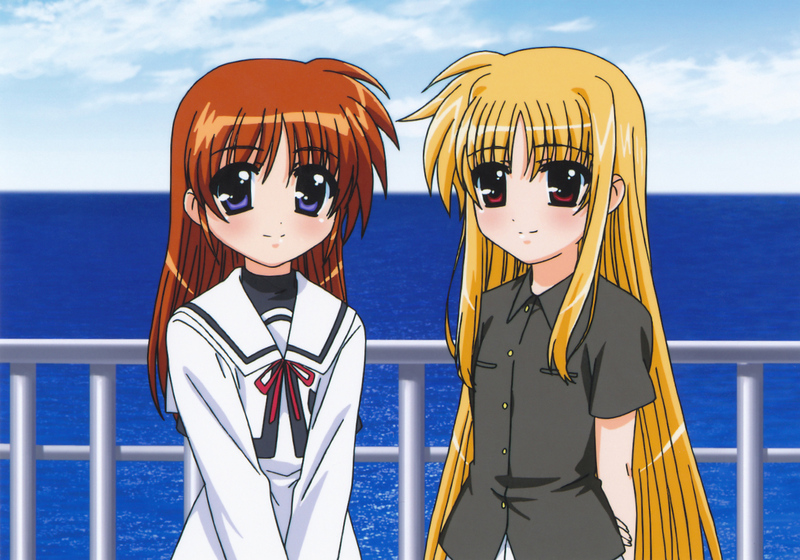 I know that I can’t ask people to watch Nanoha, especially if I’m not willing to watch it with them. Even No Name hated Nanoha so much that he still hasn’t been willing to watch any more of the series (his grudges die hard). But that’s where the 1st Movie comes in and makes all of my dreams come true. The 1st Movie, for all intents and purposes, is the same thing as the first season of the show. The difference is that whereas the original show was terrible, the movie is amazing. Everything has been improved. The pointless opening episodes and meaningless scenes have been cut and the writing is wrung taut. Nanoha and Fate’s dialog and expressions have all of the depth and splendor that they have in A’s, and both are able to be far more interesting characters when allowed to shine on the wonderful canvas of this production. The animation is top-quality, and the film features one of my favorite fights this year (the ‘aerial dogfight’ between Nanoha and Fate). Tamura Yukari, who was a newbie seiyuu back when she played Nanoha in the original series, is now one of the best in the business—she delivered some of my favorite performances in anime this year, and her Nanoha is strong as hell compared to the original. My experience with the film was the exact opposite of the original series. This time, I was enthralled from start to finish, deeply moved, teared up a few times, and was given possibly my favorite anime of 2010. The best part is that now I can recommend this masterpiece of lesbian loli love to all of my friends, and then subsequently force them to watch A’s, and the world will be a better place. Incidentally, a Nanoha A’s movie is scheduled to come out in 2012. While I think A’s is already great, the one thing it doesn’t excel in is high-budget animation (though it’s still pretty nice-looking), so if the movie manages to capture all the brilliance of the series’ story and dialog, then it will be well worth the animation revamp. Bonus: Nanoha’s transformation sequence from the TV show set to FINAL FUSION! This entry was posted in Fanboying and tagged Mahou Shoujo Lyrical Nanoha A's, Mahou shoujo Lyrical Nanoha the Movie 1st by Digibro. Bookmark the permalink. Gotta say, the next best thing after Namae wo Yonde on the big screen will be Takamachi Nantoka on the big screen. I can’t wait till… 2013, I guess, given the release rate of fansubs for these things. Ahaha, your Nanoha-fu is strong, I had to look up both references. I suppose Nanoha has to go on my list now…that list is already too long, but there’s nothing to be done about it. Other than shrink it by having multiple anime marathons, of course. Go for it I guess, though I make no promises about our tastes matching up at all.